President Trump’s rollback of Obama-era policies toward Cuba mainly affects individual travelers visiting the country on their own as tourists and will have little effect on commercial cruise lines sailing there. Trump re-imposed the requirement that “people-to-people” travelers can only come to Cuba with heavily regulated tour groups. The policy will also ban most American financial transactions with the military-linked conglomerate that dominates much of the Cuban economy, including dozens of hotels, along with state-run restaurants and tour buses. The new realities of U.S. travel to Cuba will be determined by the regulations that federal agencies will produce because of the new policy. A presidential memorandum gives the government 90 days before it even starts to rewrite Cuba travel regulations, meaning it could be many months before the changes take effect. In a statement, Carnival Cruise Lines said it is “pleased” that its ships will continue to sail to Cuba and Holland America Line recently announced plans to visit Cuba in the fall. “We will review the extent of the tightening of the travel rules, but our guests have already been traveling under the 12 approved forms of travel to Cuba since we undertook our historic first cruise to Cuba more than a year ago,” a Carnival Corp. statement said. Other cruise lines chimed in after Trump finished giving his speech in Miami. “Based on the information shared today, we are very pleased to learn the news that cruises to Cuba will continue under the new guidelines laid out by the administration,” a statement from Norwegian Cruise Line Holdings said. NCLH operates Norwegian Cruise Line, Oceania Cruises and Regent Seven Seas Cruises, all of which sail to Cuba. 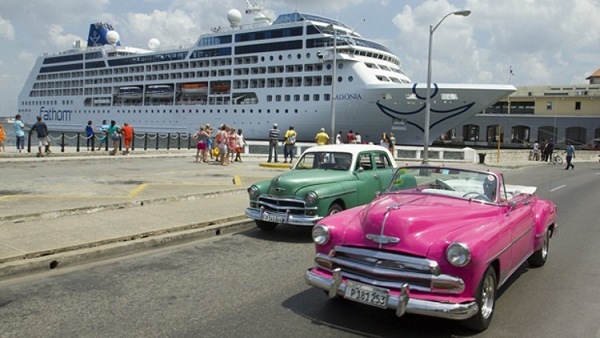 Royal Caribbean Cruises Ltd. also praised the new Cuba policy. “Royal Caribbean is pleased there is no impact to any of our cruises to Cuba as announced in the new U.S. policy toward Cuba today,” said a statement from RCCL, whose Royal Caribbean International and Azamara Club Cruises brands make stops in Cuba. Although cruise lines appear to have emerged unscathed from the Cuba policy review, the exact impact will depend on rule revisions forthcoming from the Treasury Department and other U.S. agencies. The Treasury Department said individuals who bought an airline ticket or rented a room or car before Trump’s announcement could make additional travel-related purchases for that travel under the Obama policy, even if their trip to Cuba takes place after the new, stricter Trump regulations go into effect.